In the current study, the research team, led by Hironao Miyatake, Surhud More and Masahiro Takada of the Kavli Institute for the Physics and Mathematics of the Universe, analyzed observational data from the Sloan Digital Sky Survey’s DR8 galaxy catalog. 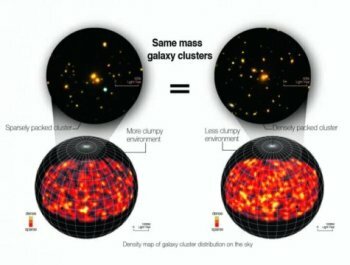 Using this data, they demonstrated that when and where galaxies group together within a cluster impacts the cluster’s relationship with its dark matter environment. 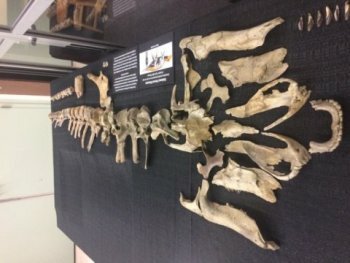 An international team of researchers has identified and named a new species of dinosaur that is the most complete, primitive duck-billed dinosaur to ever be discovered in the eastern United States. This new discovery also shows that duck-billed dinosaurs originated in the eastern United States, what was then broadly referred to as Appalachia, before dispersing to other parts of the world. The research team outlined its findings in the Journal of Vertebrate Paleontology. “This is a really important animal in telling us how they came to be and how they spread all over the world,” said Florida State University Professor of Biological Science Gregory Erickson, one of the researchers on the team. They named the new dinosaur Eotrachodon orientalis, which means “dawn rough tooth from the east.” The name pays homage to “Trachodon,” which was the first duck-billed dinosaur named in 1856. This duck-billed dinosaur — also known as a Hadrosaurid — was probably 20 to 30 feet long as an adult, mostly walked on its hind legs though it could come down on all four to graze on plants with its grinding teeth, and had a scaly exterior. But what set it apart is that it had a large crest on its nose. “This thing had a big ugly nose,” Erickson said. That large crest on the nose, plus indentations found in the skull and its unique teeth alerted Erickson and his colleagues from McWane Science Center in Birmingham, Ala., and the University of Bristol in the United Kingdom that the skeleton they had was something special. The skeletal remains of this 83-million-year-old dinosaur were originally found by a team of amateur fossil enthusiasts alongside a creek in Montgomery County, Alabama in marine sediment. Dinosaurs from the South are extremely rare. A set with a complete skull is an even more extraordinary find. The dinosaur likely was washed out to sea by river or stream sediments after it died. When the group realized they had potentially discovered something of scientific importance, they contacted McWane Science Center in Birmingham, which dispatched a team to the site to carefully remove the remains from the surrounding rock. After the bones were prepared and cleaned at McWane Science Center and the University of West Alabama, they were studied by a team of paleontologists including Erickson, former FSU doctoral student Albert Prieto-Marquez who is now at the University of Bristol, and Jun Ebersole, director of collections at McWane Science Center. Among the recovered remains of this new dinosaur are a complete skull, dozens of backbones, a partial hip bone and a few bones from the limbs. It is one of the most complete dinosaur skeletons ever to be found in the eastern United States. Its teeth, which show this dinosaur’s remarkable ability to grind up plants in a manner like cows or horses, were present in early hadrosaurids, allowing them to consume a wide variety of plants as the group radiated around the world. During the late Cretaceous Period, roughly 85 million years ago, North America was divided in half by a 1,000 mile ocean that connected the Gulf of Mexico to the Arctic Ocean. This body of water created two North American landmasses, Laramidia to the west and Appalachia to the east. The area of what was considered Appalachia is a bit wider than what we call Appalachia today. It began roughly in Georgia and Alabama and stretched all the way north into Canada. Erickson brought some bone samples and teeth back to his lab at Florida State for further analysis. He found it difficult to pinpoint the exact age of the dinosaur because no growth lines appeared in the bone samples. However, the highly vascularized bones show that it was growing very rapidly at the time of death, akin to a teenager, and stood to get much larger — perhaps 20-30 feet in length, which is typical of duck-billed dinosaurs found elsewhere. The remains of Eotrachodon are housed at McWane Science Center in Birmingham and are currently on display in Ebersole’s laboratory for the general public to view. How did the Universe begin? And what came before the Big Bang? Cosmologists have asked these questions ever since discovering that our Universe is expanding. The answers aren’t easy to determine. The beginning of the cosmos is cloaked and hidden from the view of our most powerful telescopes. Yet observations we make today can give clues to the universe’s origin. New research suggests a novel way of probing the beginning of space and time to determine which of the competing theories is correct. The most widely accepted theoretical scenario for the beginning of the Universe is inflation, which predicts that the universe expanded at an exponential rate in the first fleeting fraction of a second. However a number of alternative scenarios have been suggested, some predicting a Big Crunch preceding the Big Bang. The trick is to find measurements that can distinguish between these scenarios. One promising source of information about the universe’s beginning is the cosmic microwave background (CMB) — the remnant glow of the Big Bang that pervades all of space. This glow appears smooth and uniform at first, but upon closer inspection varies by small amounts. Those variations come from quantum fluctuations present at the birth of the universe that have been stretched as the universe expanded. The conventional approach to distinguish different scenarios searches for possible traces of gravitational waves, generated during the primordial universe, in the CMB. “Here we are proposing a new approach that could allow us to directly reveal the evolutionary history of the primordial universe from astrophysical signals. This history is unique to each scenario,” says coauthor Xingang Chen of the Harvard-Smithsonian Center for Astrophysics (CfA) and the University of Texas at Dallas. While previous experimental and theoretical studies give clues to spatial variations in the primordial universe, they lack the key element of time. Without a ticking clock to measure the passage of time, the evolutionary history of the primordial universe can’t be determined unambiguously. “Imagine you took the frames of a movie and stacked them all randomly on top of each other. If those frames aren’t labeled with a time, you can’t put them in order. Did the primordial universe crunch or bang? If you don’t know whether the movie is running forward or in reverse, you can’t tell the difference,” explains Chen. Subatomic heavy particles will behave like a pendulum, oscillating back and forth in a universal and standard way. They can even do so quantum-mechanically without being pushed initially. Those oscillations or quantum wiggles would act as clock ticks, and add time labels to the stack of movie frames in our analogy. “Ticks of these primordial standard clocks would create corresponding wiggles in measurements of the cosmic microwave background, whose pattern is unique for each scenario,” says coauthor Yi Wang of The Hong Kong University of Science and Technology. However, current data isn’t accurate enough to spot such small variations. Ongoing experiments should greatly improve the situation. Projects like CfA’s BICEP3 and Keck Array, and many other related experiments worldwide, will gather exquisitely precise CMB data at the same time as they are searching for gravitational waves. If the wiggles from the primordial standard clocks are strong enough, experiments should find them in the next decade. Supporting evidence could come from other lines of investigation, like maps of the large-scale structure of the universe including galaxies and cosmic hydrogen. 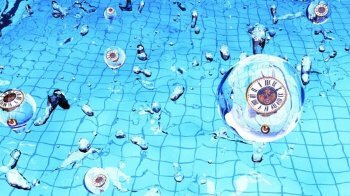 And since the primordial standard clocks would be a component of the “theory of everything,” finding them would also provide evidence for physics beyond the Standard Model at an energy scale inaccessible to colliders on the ground. A team of researchers has observed the brightest ultra metal-poor star ever discovered. The star is a rare relic from the Milky Way’s formative years. As such, it offers astronomers a precious opportunity to explore the origin of the first stars that sprung to life within our galaxy and the universe. A Brazilian-American team including Vinicius Placco, a research assistant professor at the University of Notre Dame and a member of JINA-CEE (Joint Institute for Nuclear Astrophysics — Center for the Evolution of the Elements), and led by Jorge Meléndez from the University of São Paulo used two of European Southern Observatory’s telescopes in Chile to discover this star, named 2MASS J18082002-5104378. 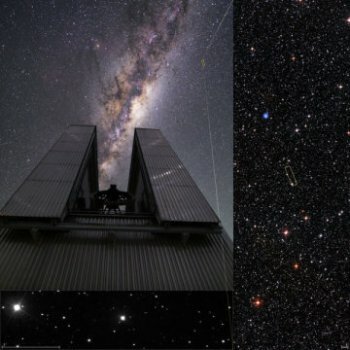 The star was spotted in 2014 using ESO’s New Technology Telescope. Follow-up observations using ESO’s Very Large Telescope discovered that, unlike younger stars such as the sun, this star shows an unusually low abundance of what astronomers call metals — elements heavier than hydrogen and helium. It is so devoid of these elements that it is known as an ultra metal-poor star. Although thought to be ubiquitous in the early universe, metal-poor stars are now a rare sight within both the Milky Way and other nearby galaxies. Metals are formed during nuclear fusion within stars, and are spread throughout the interstellar medium when some of these stars grow old and explode. Subsequent generations of stars therefore form from increasingly metal-rich material. Metal-poor stars, however, formed from the unpolluted environment that existed shortly after the Big Bang. Exploring stars such as 2MASS J18082002-5104378 may unlock secrets about their formation, and show what the universe was like at its very beginning. Earth has some special features that set it apart from its close cousins in the solar system, including large oceans of liquid water and a rich atmosphere with just the right ingredients to support life as we know it. Earth is also the only planet that has an active outer layer made of large tectonic plates that grind together and dip beneath each other, giving rise to mountains, volcanoes, earthquakes and large continents of land. Geologists have long debated when these processes, collectively known as plate tectonics, first got underway. Some scientists propose that the process began as early as 4.5 billion years ago, shortly after Earth’s formation. Others suggest a much more recent start within the last 800 million years. A study from the University of Maryland provides new geochemical evidence for a middle ground between these two extremes: An analysis of trace element ratios that correlate to magnesium content suggests that plate tectonics began about 3 billion years ago. The results appear in the January 22, 2016 issue of the journal Science. The study zeros in on one key characteristic of Earth’s crust that sets it apart geochemically from other terrestrial planets in the solar system. Compared with Mars, Mercury, Venus and even our own moon, Earth’s continental crust contains less magnesium. Early in its history, however, Earth’s crust more closely resembled its cousins, with a higher proportion of magnesium. At some point, Earth’s crust evolved to contain more granite, a magnesium-poor rock that forms the basis of Earth’s continents. Many geoscientists agree that the start of plate tectonics drove this transition by dragging water underneath the crust, which is a necessary step to make granite. A logical approach would be to look at the magnesium content in ancient rocks formed across a wide span of time, to determine when this transition toward low-magnesium crustal rocks began. However, this has proven difficult because the direct evidence–magnesium–has a pesky habit of washing away into the ocean once rocks are exposed to the surface. Tang, Rudnick and Kang Chen, a graduate student at China University of Geosciences on a one and a half-year research visit to UMD, sidestepped this problem by looking at trace elements that are not soluble in water. These elements–nickel, cobalt, chromium and zinc–stay behind long after most of the magnesium has washed away. The researchers found that the ratios of these elements hold the key: higher ratios of nickel to cobalt and chromium to zinc both correlate to higher magnesium content in the original rock. Tang and his coauthors compiled trace element data taken from a variety of ancient rocks that formed in the Archean eon, a time period between 4 and 2.5 billion years ago, and used it to determine the magnesium content in the rocks when they were first formed. They used these data to construct a computer model of the early Earth’s geochemical composition. This model accounted for how magnesium (specifically, magnesium oxide) content in the crust changed over time. The results suggest that 3 billion years ago, the Earth’s crust had roughly 11 percent magnesium oxide by weight. Within a half billion years, that number had dropped to about 4 percent, which is very close to the 2 or 3 percent magnesium oxide seen in today’s crust. 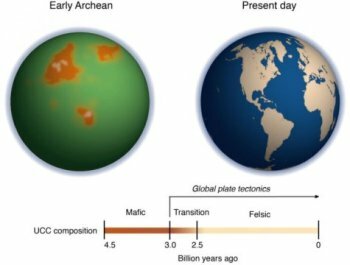 This suggested that plate tectonics began about 3 billion years ago, giving rise to the continents we see today. Invisible structures shaped like noodles, lasagne sheets or hazelnuts could be floating around in our Galaxy radically challenging our understanding of gas conditions in the Milky Way. CSIRO astronomer and first author of a paper released in Science Dr Keith Bannister said the structures appear to be ‘lumps’ in the thin gas that lies between the stars in our Galaxy. “They could radically change ideas about this interstellar gas, which is the Galaxy’s star recycling depot, housing material from old stars that will be refashioned into new ones,” Dr Bannister said. Dr Bannister and his colleagues described breakthrough observations of one of these ‘lumps’ that have allowed them to make the first estimate of its shape. 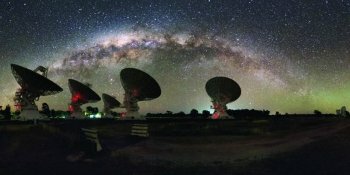 The observations were made possible by an innovative new technique the scientists employed using CSIRO’s Compact Array telescope in eastern Australia. Astronomers got the first hints of the mysterious objects 30 years ago when they saw radio waves from a bright, distant galaxy called a quasar varying wildly in strength. They figured out this behaviour was the work of our Galaxy’s invisible ‘atmosphere’, a thin gas of electrically charged particles which fills the space between the stars. “Lumps in this gas work like lenses, focusing and defocusing the radio waves, making them appear to strengthen and weaken over a period of days, weeks or months,” Dr Bannister said. These episodes were so hard to find that researchers had given up looking for them. But Dr Bannister and his colleagues realised they could do it with CSIRO’s Compact Array. Pointing the telescope at a quasar called PKS 1939-315 in the constellation of Sagittarius, they saw a lensing event that went on for a year. Astronomers think the lenses are about the size of the Earth’s orbit around the Sun and lie approximately 3000 light-years away — 1000 times further than the nearest star, Proxima Centauri. Until now they knew nothing about their shape, however, the team has shown this lens could not be a solid lump or shaped like a bent sheet. “We could be looking at a flat sheet, edge on,” CSIRO team member Dr Cormac Reynolds said. Getting more observations will “definitely sort out the geometry,” he said. While the lensing event went on, Dr Bannister’s team observed it with other radio and optical telescopes. The optical light from the quasar didn’t vary while the radio lensing was taking place. This is important, Dr Bannister said, because it means earlier optical surveys that looked for dark lumps in space couldn’t have found the one his team has detected. So what can these lenses be? One suggestion is cold clouds of gas that stay pulled together by the force of their own gravity. That model, worked through in detail, implies the clouds must make up a substantial fraction of the mass of our Galaxy. Nobody knows how the invisible lenses could form. “But these structures are real, and our observations are a big step forward in determining their size and shape,” Dr Bannister said. Caltech researchers have found evidence of a giant planet tracing a bizarre, highly elongated orbit in the outer solar system. The object, which the researchers have nicknamed Planet Nine, has a mass about 10 times that of Earth and orbits about 20 times farther from the Sun on average than does Neptune (which orbits the Sun at an average distance of 2.8 billion miles). In fact, it would take this new planet between 10,000 and 20,000 years to make just one full orbit around the Sun. The researchers, Konstantin Batygin and Mike Brown, discovered the planet’s existence through mathematical modeling and computer simulations but have not yet observed the object directly. Batygin and Brown describe their work in the current issue of the Astronomical Journal and show how Planet Nine helps explain a number of mysterious features of the field of icy objects and debris beyond Neptune known as the Kuiper Belt. The road to the theoretical discovery was not straightforward. In 2014, a former postdoc of Brown’s, Chad Trujillo, and his colleague Scott Shepherd published a paper noting that 13 of the most distant objects in the Kuiper Belt are similar with respect to an obscure orbital feature. To explain that similarity, they suggested the possible presence of a small planet. Brown thought the planet solution was unlikely, but his interest was piqued. Fairly quickly Batygin and Brown realized that the six most distant objects from Trujillo and Shepherd’s original collection all follow elliptical orbits that point in the same direction in physical space. That is particularly surprising because the outermost points of their orbits move around the solar system, and they travel at different rates. The first possibility they investigated was that perhaps there are enough distant Kuiper Belt objects — some of which have not yet been discovered — to exert the gravity needed to keep that subpopulation clustered together. The researchers quickly ruled this out when it turned out that such a scenario would require the Kuiper Belt to have about 100 times the mass it has today. That left them with the idea of a planet. Their first instinct was to run simulations involving a planet in a distant orbit that encircled the orbits of the six Kuiper Belt objects, acting like a giant lasso to wrangle them into their alignment. Batygin says that almost works but does not provide the observed eccentricities precisely. “Close, but no cigar,” he says. Then, effectively by accident, Batygin and Brown noticed that if they ran their simulations with a massive planet in an anti-aligned orbit — an orbit in which the planet’s closest approach to the sun, or perihelion, is 180 degrees across from the perihelion of all the other objects and known planets — the distant Kuiper Belt objects in the simulation assumed the alignment that is actually observed. “Your natural response is ‘This orbital geometry can’t be right. This can’t be stable over the long term because, after all, this would cause the planet and these objects to meet and eventually collide,'” says Batygin. But through a mechanism known as mean-motion resonance, the anti-aligned orbit of the ninth planet actually prevents the Kuiper Belt objects from colliding with it and keeps them aligned. As orbiting objects approach each other they exchange energy. So, for example, for every four orbits Planet Nine makes, a distant Kuiper Belt object might complete nine orbits. They never collide. Instead, like a parent maintaining the arc of a child on a swing with periodic pushes, Planet Nine nudges the orbits of distant Kuiper Belt objects such that their configuration with relation to the planet is preserved. But little by little, as the researchers investigated additional features and consequences of the model, they became persuaded. “A good theory should not only explain things that you set out to explain. It should hopefully explain things that you didn’t set out to explain and make predictions that are testable,” says Batygin. And indeed Planet Nine’s existence helps explain more than just the alignment of the distant Kuiper Belt objects. It also provides an explanation for the mysterious orbits that two of them trace. The first of those objects, dubbed Sedna, was discovered by Brown in 2003. Unlike standard-variety Kuiper Belt objects, which get gravitationally “kicked out” by Neptune and then return back to it, Sedna never gets very close to Neptune. A second object like Sedna, known as 2012 VP113, was announced by Trujillo and Shepherd in 2014. Batygin and Brown found that the presence of Planet Nine in its proposed orbit naturally produces Sedna-like objects by taking a standard Kuiper Belt object and slowly pulling it away into an orbit less connected to Neptune. 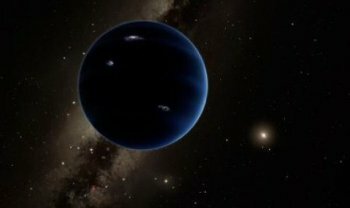 Where did Planet Nine come from and how did it end up in the outer solar system? Scientists have long believed that the early solar system began with four planetary cores that went on to grab all of the gas around them, forming the four gas planets — Jupiter, Saturn, Uranus, and Neptune. Over time, collisions and ejections shaped them and moved them out to their present locations. “But there is no reason that there could not have been five cores, rather than four,” says Brown. Planet Nine could represent that fifth core, and if it got too close to Jupiter or Saturn, it could have been ejected into its distant, eccentric orbit. Batygin and Brown continue to refine their simulations and learn more about the planet’s orbit and its influence on the distant solar system. Meanwhile, Brown and other colleagues have begun searching the skies for Planet Nine. Only the planet’s rough orbit is known, not the precise location of the planet on that elliptical path. If the planet happens to be close to its perihelion, Brown says, astronomers should be able to spot it in images captured by previous surveys. If it is in the most distant part of its orbit, the world’s largest telescopes — such as the twin 10-meter telescopes at the W. M. Keck Observatory and the Subaru Telescope, all on Mauna Kea in Hawaii — will be needed to see it. If, however, Planet Nine is now located anywhere in between, many telescopes have a shot at finding it. In terms of understanding more about the solar system’s context in the rest of the universe, Batygin says that in a couple of ways, this ninth planet that seems like such an oddball to us would actually make our solar system more similar to the other planetary systems that astronomers are finding around other stars. First, most of the planets around other sunlike stars have no single orbital range — that is, some orbit extremely close to their host stars while others follow exceptionally distant orbits. Second, the most common planets around other stars range between 1 and 10 Earth-masses.